Ava Joyce Johnson came into the world at 4:42 a.m. on Sunday, September 23, 2018, at Baptist Medical Center in Jackson, MS, where she fought fiercely with the help of the amazing NICU team. Ava's tiny heart finally gave out, and she passed peacefully into the arms of Jesus a short 12 hours later. Ava is the daughter of Aubrey Joe "AJ" and Alicia Rodriquez Johnson of Vicksburg. She is survived at her home in Clinton by sister Charlotte Ann Johnson and uncle James Carson Bennett. "Our Little Angel" is loved and dearly missed, but her memory will live on in the hearts of her family including paternal grandparents, David and Joyce "Jodie" Johnson of Vicksburg; paternal great-grandmother, Joyce Houston Smith also of Vicksburg; maternal grandparents, Milton and Sheri Byars Langston of Cordova, TN; maternal great-grandparents, Roy and Judy Jones Byars of Batesville; aunts and uncles Ian and Allie Joyce Derrick of Columbia, TN, and Eric and Ashley Hesselberg of Vicksburg; great-aunts and uncles Clark and Helen Byars Logan of Atlanta, GA, Perry and Leah Byars Ellis of Madison, and Roy "Bubba" and Chassidy Vancleave Byars of Southaven, as well as 2 cousins and 6 second cousins. 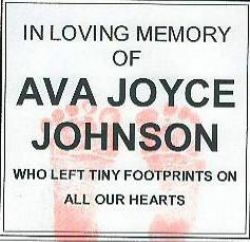 Ava's brief life was a precious gift from God, and she touched countless other lives in her short time here on Earth. Visitation will be Monday, October 1, from 10:00-11:00 at Glenwood Funeral Home in Vicksburg with services directly following. The family requests that you wear bright colors in honor of Ava and her fighting spirit. In lieu of flowers, memorial donations can be made to the Baptist Medical Center NICU or McClean Fletcher Grief Center for Children.